Jazz Night School features two sets of summer session performances and instructor quartet led by Erik Hanson, this Saturday, July 14 at 7pm, at the Rainier Valley Cultural Center. Come hear singing with jazz trio vocalists and small jazz ensembles — good music from people having fun, learning jazz. Second set features Jazz Night School instructor quartet led by Erik Hanson, playing unique jazz standards and originals. 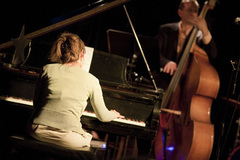 Jazz Night School proudly presents student performances at the end of each session. This Saturday at 7:00 pm! All ages welcome! Plenty of seats — bring the kids! Free Jazz Night School stickers and Frank Sinatra and Mary Lou Williams posters.